CF™488A is a green fluorescent dye optimally excited by the 488 nm argon laser line. Under common detection conditions, CF™488A is at least as bright as Alexa Fluor® 488. However, a major advantage of CF™488A over Alexa Fluor® 488 is that antibody conjugates prepared from the former are biologically more specific. Alexa Fluor® 488 carries multiple negative charges, which can significantly change the isoelectric point of the proteins the dye labels and consequently alter the specificity of the protein conjugates. CF™488A, on the other hand, is minimally charged. Thus, antibody conjugates prepared from the dye ensure biological detection with high signal-to-noise ratio. Another feature of CF™488A is that the emission peak wavelength is about 10 nm shorter than that of Alexa Fluor® 488 and 15 nm shorter than that of the traditional green dye FITC (or FAM). 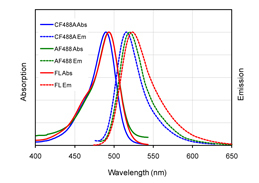 The shorter wavelength of CF™488A offers the advantage of less fluorescence “spill-over” in the red channel in multi-color detection applications. A full selection of reactive dyes, secondary antibodies, antibody labeling kits, and other bioconjugates including phalloidins, Annexin V and α-bungarotoxin are also available for CF™ dyes. Figure 1. Absorption and emission spectra of CF™488A (blue), Alexa Fluor® 488 (green) and FITC (red) conjugated to goat anti-mouse IgG in PBS. Figure 2. 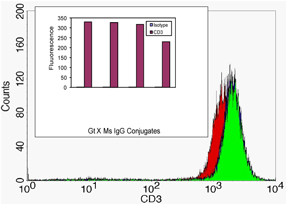 Jurkat cells were stained with 0.5 ug intracellular CD3 or isotype control (BD Biosciences) followed by 1 ug goat anti-mouse IgG conjugates from the manufacturer’s shown above. Fluorescence was analyzed on a Beckman Coulter FC-500. The bars represent the median values of the gated population of cells. The histogram depicts CF488A (green), Alexa Fluor488 (blue), DyLight488 Pierce (purple) and DyLight488 KPL (red) stained cells.